were two additional chicks reported that could not be confirmed). and one was from Wisconsin. year was 4.1 years and for females it was 3.8 years). I am still doing final counts on my tabulations from 2013 to be SURE the numbers are accurate...meanwhile, as we wait for the birds, I know many of you are interested in the stories of specific ospreys. I find myself thinking of four ospreys in particular. One is the male who will be the oldest this year. Mr 79 who has nested for many years at the Arboretum (which now has a cam on it) will be 22 years old if he survived another migration. He has a history of being a late return to his territory. His mates have often beat him back and engaged in some extra pair copulation and he has had to chase off some other males. Last year he got a new, young female, but their nest failed. I am anxious to see if he makes it back. The second oldest male would be Mr B4. He would be 21 this year. He has been a reliable male, with several mates but this would be his 13th season with his mate, if they both survived. He is the last of the hacked birds from the reintroduction. He was translocated from northern MN and released at the Cedar lake hack site. He returned to MN when he was two years old and spent that summer hanging around the Medicine Lake hack site, where I was the hack site attendant. He then nested on Mooney lake in Wayzata in 1996, moved to a nest on the lights at Wayzata West Middle School in 2001, and then moved to a nest on private property on Robinsons Bay and has been there since 2004. The oldest female will be 20 this year and is nesting on the Lake Minnetonka Regional Park Cell tower where she has been since 2000. The other female that I am anxious to see is the female on the Edina nest who had some eye issues last year. I hope she could see well enough to care for herself and to survive another migration. She was hacked out in Iowa and will be 12 years old this year. Those of us who have been watching these birds for years grow very fond of our winged friends! PS Hacking is a falconers term...it is a technique for slow release of non flighted birds. This population of ospreys is the result of reintroduction efforts. Nestling ospreys were collected in northern MN and translocated to several hack sites in the metro area. A hack box is a large box(6ft x 6ft) on scaffolding with hardware cloth on the outside to protect these non flighted chicks from predation and yet to allow them to see their new home territory. I was one of the hack site attendants who fed the chicks small pieces of fish twice a day until they developed enough to be ready for flight. We had several different methods for releasing them when they were ready. They flew and learned to fish while we continued to provide food for them until they naturally dispersed. They imprint on the area where they learned to fly and return when they are old enough to breed. So B4 is a bird who went thru that process and returned to nest and has produced 38 chicks. 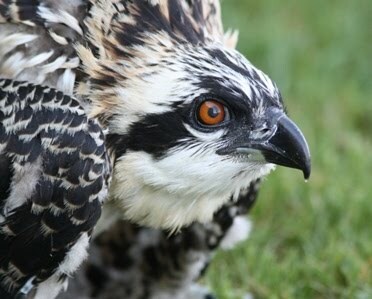 Well osprey fans...here it is 2014 and we are preparing for another osprey season. I am working hard on last years report, making charts, tabulating results, checking and rechecking all my data to be sure it is accurate. Many of you may have seen the post on the MOUnet about an osprey seen in Sherburne NWR a few days ago! That is a very early return in any year, but especially this year with all the snow and frozen lakes. Surprise, surprise. I wonder what other surprises are in store for us! We always need volunteers to help monitor all these nests (105) so email us you want to get more involved! More posts are coming about research methods and the 2013 numbers.